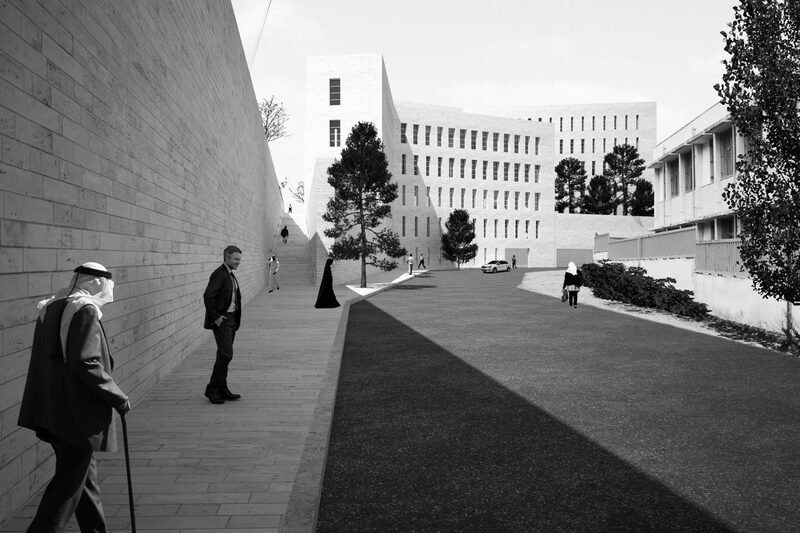 AAU ANASTAS was selected to design the courts complex of Hebron. 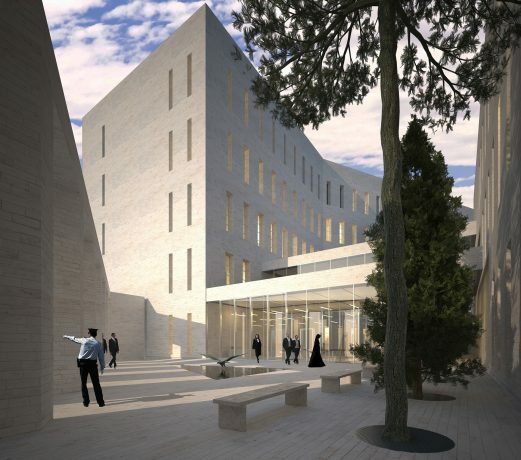 Located in a developing business district in the northern part of Hebron, the project will constitute a structural component of the area’s urbanism. 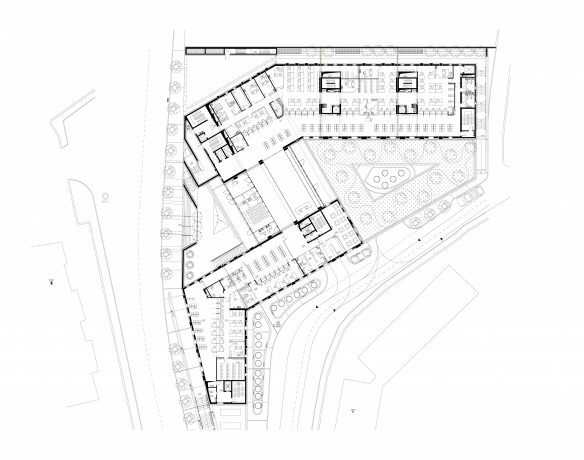 The project’s parcel has an irregular shape, and is surrounded by public governmental buildings. 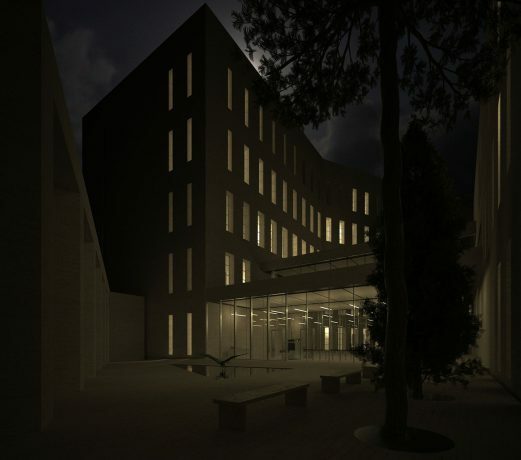 The proposed volume of the courts complex follows the shape of the parcel. Two buildings are separated by an open patio. The main building accommodates the court halls, and the second building, the services and the prosecution department. 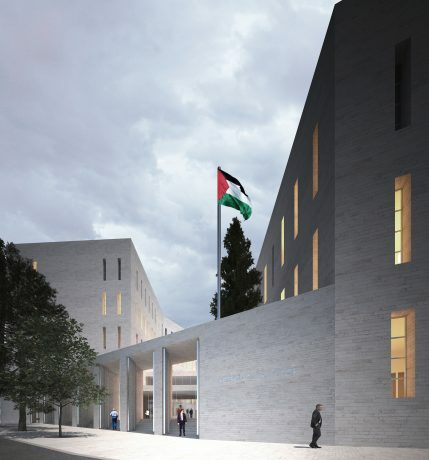 Inspired by the porosity strategy found in the Palestinian architecture, the Hebron courthouse is thought as one continuous monolithic abstract envelope. The courthouse becomes a monument in the city. The building will generate an envelope of 8,000 m2 in the urban context of the city. The continuity in the concept of the facade is designed to integrate the building in its environment adapting the openings to the scale of the users. Adapting fundamentals of Palestinian architecture to a more contemporary programmatic demand, is our response to integrating large scale public buildings into the urban fabric of the city. Our stance is to consider historical reference a main enhancer of monumentalism. The general positioning of windows intends to make the reading of stories, and thus scale, disappear in order to strengthen the initial integration-in-the-city strategy. As for the specific positioning of windows in regards with each space, the positioning and number of windows are arranged to satisfy comfortable requirements of illuminance, views in standing and sitting positions, shading during working hours, and energy savings.